I’ve been messing around with some old seed beads I had lying around my house and really liked it. I’ve decided I want to get a bead loom and try to make some small pouches, bracelets and maybe even some chokers. 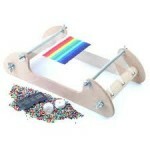 So my question is, what’s the best (and cheapest) loom for a beginner? Also, what brand of seed beads should I be looking for? I’ve heard that some of the Japanese seed beads are pretty good, but I dunno which particular brand’s beads are best for bead looming. Also, how many beads would I need to make just a few (2-3) small projects to start out? Any suggestions would be appreciated. Thanks! Here is a nice website for learning how to use bead looms. It gives instructions on how to make your own loom along with explanations on how to weave the beads and some simple patterns. Just click on the links. You can make something very simple or go as complicated as you want. There are a lot of loom patterns on the Internet to choose from. How do I use up the seed beads that I have left over from other projects? I have loads of them and I need a project. You can make beaded safety pins, which consist of 10 to 12 safety pins, which are threaded with seed beads, and make a design when placed next to one another. Check out the tutorial at Crafts For All Seasons. Look at the bottom of the page, then there are links to the different tutorials. I recently downloaded Doris Coghill’s “fresh Twist”. I have not used the large hole beads before because the hole was not big enough for my seed bead rope! Was excited to see this project. Now I can’t find a bead large enough to fit the rope. Her’s is a 12mm(id) Anyone know where i can get these extra large inside diameter beads?? How many 10/0 seed beads in one hank pack? I am taking on a craft project with 75 scouts that will require around 10,000-12,000 white seed beads and 2,000 red seed beads. We are on a tight budget and I only want to order what I need and not have a bunch of beads left over that I will never use. How many 10/0 Czech seed beads are in one hank pack?